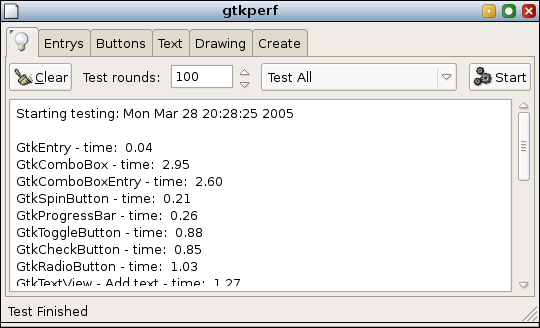 The reason why GtkPerf exists is that at that time I needed an easy tool to test the performance of GTK+ widgets & graphics. Mainly it was used to spot performance regressions and test how theme changes affected the performance, as well as different patches in GTK+. There has been some requests like this floating around: "Would you also make QtPerf, with similar widgets and features. This way it would be possible to make GTK+ vs. Qt testing..."
Extensive answer: The actual result ( = score) of GtkPerf is quite meaningless as there are plenty of moving parts which affect to score. It would be totally possible to create similar application with Qt, using Qt widgets. But in wrong hands it could lead into "See, X-toolkit is faster than Y-toolkit, here are the results"-kind of things where X and Y can switch places based on the moon phase... So GtkPerf is mostly only usable when you know your system, do some tweaking, test again etc. BUT: I'm considering implementing something to test performance of QGraphicsView, the canvas in Qt. This would test drawing speed, rotation, scaling etc. for different items, pimaps, widgets-on-canvas and so forth. In case there exist such tool already, please let me know?